Assam is one of India’s most fascinating and diverse states and the MV Mahabaahu is the perfect way to relax and enjoy the beauty of this oft-forgotten region. Land travel in Assam is often difficult but gliding along the Brahmaputra gets travellers close to the most wonderful destinations in this stunning state. Assam boasts of muga, paat and eri silk culture, utensils of bell metal, paddy fields, bamboo and cane, world’s hottest king chillies and most certainly the one-horned rhinoceros, the Asiatic Wild Buffalo, the Wild Tuskers and the highest density of the shy cat; the Royal Bengal Tiger. It also offers bird life of more than 450 species. Assam is home to many indigenous tribal groups, and along the way, guests will get to interact with them on village visits, and see their traditional tribal handicrafts being made. They are the perfect souvenirs of this amazing trip. From travel to the indigenous food, from luxury cruising to immersive culture, come experience Assam in its most authentic form. Cruising the Brahmaputra, one of the great rivers of the world, on the truly luxurious MV Mahabaahu is surely one of life’s great pleasures. The Brahmaputra River originates in Tibet, where it is known as the Yarlung Tsangpo and is considered holy by Hindus and Buddhists alike. Civilisations have lived along the river for thousands of years, many in isolation from each other due to the extensive forests. The Brahmaputra is the only river in India to be given a male name and travels 2,900km from Tibet, through India to Bangladesh where it flows into the Bay of Bengal. This is the greatest river island system with the smallest and largest inhabited islands of the world located here. It is the only navigable river of the world under the shadows of over 7,000 meter high, towering snow-covered Himalayan mountains. This is also, the only river apart from the Zambezi River in Africa from which elephant, jeep and boat safaris can take place in the Kaziranga National Park, described as the Serengeti of India. The ship offers 23 en-suite cabins, some with and some without private balconies. There is a swimming pool, a proper SPA, bar, lounge, restaurant, open bar at the sundeck and two armchair equipped tenders for the boat safaris, excursions, and transfers. It is an internationally certified ship featuring all modern safety features. There is no other such ship and the program is unique as it offers eleven destinations in the seven nights and eight days of cruising from October till early May. The MV Mahabaahu languidly cruises alongside the Kaziranga National Park which is home to the greatest population of the single-horned rhinos. Guests will witness the Big Five mammals found here as well as the Big Five birds! It’s not uncommon to witness tigers, elephants and other flora and fauna from the ship itself. The ship has been rated by CruiseCritic.com as a four-star ship where the Sunday Times of UK called it as among the Top Fifty Adventure Holidays of the World and the Travelinsider of Qantas Australian Airlines called it among the Top Ten River Cruises of the World! 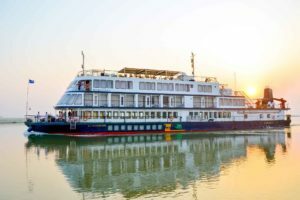 The cruise also brings the travellers to visit tea plantations where the English Breakfast Tea was born, temples, monasteries, tribal and weaver villages and palaces. Because of this, the Daily Telegraph called it as one of the richest combinations of natural and living history on one of the most pristine large rivers of the world, Nat Geo People Channel featured it in their Dream Cruise program worldwide and CNN mentioned this destination to be among the top ten adventure cruises of the world!